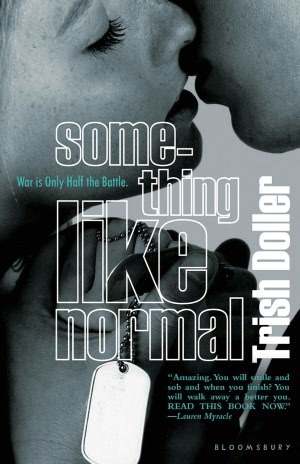 "Something Like Normal by Trish Doller is a great story of love and guilt, of honor and mistakes. It follows the life of Travis, a marine recently back form Afghanistan who is haunted by the death of his best friend. He meets Harper, a girl whose life he destroyed years ago. The turmoil that ensues kept me reading. I read this book in less than 7 hours, so it is a relatively quick read. Great book overall!" "Exquisite Captive by Heather Demetrios is a beautifully woven story that captures you the minute you open the book. It stars a young girl with an amazing power, she is a jinni, a being from another world, longing for freedom from her master. She then meets Raif, her enemy in her homeland, who now needs her help. The story takes you on an epic journey of adventure, hope, and forever changing feelings. The book was so captivating I read the last half in 6 hours. I couldn't put the book down. I give this book two thumbs up." "The Selection by Kiera Cass is a phenomenal read. It follows a girl who enters the competition for the prince's heart against her own wishes. But as the competition goes on she starts doing the one thing she never thought she would do, fall for the prince. But with 34 other women vying for the prince's heart, how will hers fair against jealousy. I thoroughly enjoyed this book and can't wait to get my hands on the rest of the trilogy."